(CNN) -- The first woman to fly a tactical fighter jet in the US Navy opened the door for more than just women in combat. She also helped them with the transition to civilian life. Now, at her funeral, retired Navy Capt. Rosemary Mariner will receive the first-ever all-female flyover. 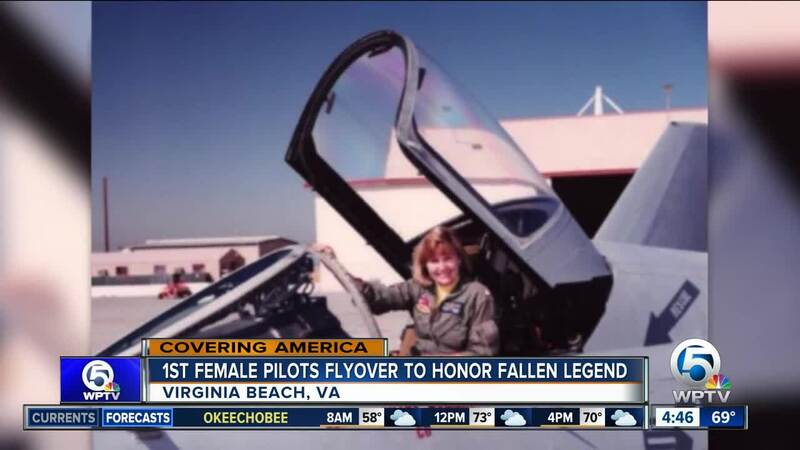 Commander Stacy Uttecht, Commander Leslie Mintz, Lieutenant Commander Paige Blok and Lieutenant Commander Danielle Thiriot -- all from squadrons based at the Naval Air Station in Oceana, Virginia -- will fly "Super Hornet" jets at Mariner's funeral service Saturday in Maynardville, Tennessee, near her home. "It was an honor and privilege to know her." According to her obituary , Mariner was born in Harlingen, Texas, and raised in San Diego, California, before graduating from Purdue University at age 19 with a degree in aeronautics. In 1973, she and five other women entered officer candidacy school after the Navy opened its flight school to women. The transition happened so fast that their uniforms consisted of dresses and heels for the first two years, a fellow naval officer told CNN. According to the Navy the six became the first women in any military branch to earn their wings. Four years after flight school, Mariner became the Navy's first female jet pilot in 1978 after a landmark legal case, Owens v. Brown, ruled that a US policy prohibiting women from serving aboard Navy ships was unconstitutional. Fellow naval officer Joellen Oslund, who trained as a helicopter pilot, was one of three officer plaintiffs in the case brought by the ACLU. She told CNN that because jets and aircraft carriers were considered combat vessels, Mariner and their other female colleagues were not able to fully exercise their duties as training officers. Oslund wasn't even allowed to hover over the tail of an aircraft carrier before the law was amended. The amendment led the Navy to allow women six months of shipboard service, which also provided opportunities for deployment. The Navy says in 1982 Mariner was among the first women to serve aboard a US Navy warship -- the USS Lexington -- and to qualify as a Surface Warfare Officer. Mariner attended the National War College in Washington, DC, earning a master's degree in National Security Strategy in 1990, and served on the Staff of the Joint Chiefs at the Pentagon. Oslund told CNN that Mariner was pregnant with her daughter at the time and was known for fighting to get women in combat. She was even given the nickname "Combat Woman" -- it was not meant as a compliment -- but that didn't faze her. Mariner's final military assignment was as the Chairman of the Joint Chiefs' Chair in Military Strategy at the National War College in Washington. Before retiring in 1997, she logged over 3,500 flight hours in 15 different aircraft during her time in the Navy. After leaving the Navy, Mariner became a professor at the University of Tennessee, where she continued to lobby for women's rights in the military. Both Mariner and Oslund were involved in a 2014 decision to remove restrictions for women in combat. However, Oslund believes Mariner's legacy extends beyond the military. "Everyone who went into civilian aviation owes their career to Rosemary," Oslund said. "Also, women with aviation experience in politics would not have that opportunity available without [her] legacy." Once women were allowed to to fly combat missions, another barrier broke -- they began flying for commercial airlines after their military service ended. Flying in the military allowed women to gain the cockpit hours needed to fly for the airlines. Oslund is excited that Mariner will be honored with the all-women flyover Saturday. "The flyover would make Rosemary so happy ... beyond anything we could have hoped for," Oslund said. "It's a shame Rosie isn't here to see it, but it's so gratifying that her accomplishments are being honored and remembered."